I am French so English is obviously not my mother tongue. I am not a Tamaskan owner but I am more an more interested by this breed and even more by this adventure you are living by creating a new dog breed. And what a wolfish dog breed ! I knew for years the Czech wolf dog (is it the name in English ? 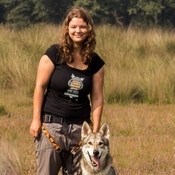 I just directly translate from the French "chien-loup tchécoslovaque) or the Sarloos wolf dog but I always was kind of unconvinced by 1. their very primitive/difficult personality, very unrecommended for not 'dog expert' 2. the skinny German Shepherd look they often have (I especially don't appreaciate the long ears). Congratulations for all the beautiful work you've done so far ! At first, I registered myself on the forum to learn more about this new ongoing breed and the breeding work you are doing. I am curious to understand the process of selection for "new blood line" in purpose of increasing the genetic diversity in the Tamaskan breed. Then I started to read topics in the Breeding section and I realised that you often talked about possibly adding some Groenendael blood in the pool. I was a bit surprised to understand that this mix seems to not be so often used so far because I saw that one of the fundation dogs really looks like a Groenendael. Why do I suddendly advocate for Groenendael ? So, when I discovered on your forum that some of you may be interested with a mix with Groenendael, even for just a trial, some crazy project started to grow in my head (with a lot of "IF", of course). Do you think it is a reasonable idea to think about adding him in the adventure of the Tamaskan breed ? I know I am new and I really don't want to appear like a foolish girl who comes with her stupid ideas But as my grandma always says : "There is no shame to ask." bienvenue! Your English is very good and I would not consider it broken at all. A groenendael was added last year and all 5 pups were (in my opinion) quite lovely. Do you have any link to website/facebook page/forum topic/whatever else about this groenendael mix litter, please ? I am very curious to have a look on what the lovely puppies (i don't doubt of it :p) look like, if they have met the expectations of their breeder (or not ? ), the positive and negative of this mix...? I was one of the advocates to have a Groenendaeler added as outcross! I was so happy when we found a Groenendael female in the Netherlands for an outcross litter. I know many people had doubts... but I was always convinced it would be an awesome outcross, and those pups have not dissapointed me! I certainly would not be against another Groenendael outcross mating in the future. Well I met with the female to determine if she were going to make a suitable outcross, which I was positive about, and also helped look for a Tamaskan male to sire the litter. I own a female Tamaskan that turned out to be unsuitable for breeding... so no, my Tamaskan was not used for this cross. They are registered on conditional registration, which is standard for all outcross litters. Once they pass all health testing etc. they can get full registration. Oh ! WOW !! They are beautiful ! Thanks Wolfsbane for sharing these pictures and for your involvement in this very nice cross ! I appreciate in particular the picture with their mom : we can really see that they genetically share something but how much the pups are bigger/stronger/wolfish than their mom. They seem to have a shorter coat than her Mom too, but a bit longer than their Dad ? Do they ? They kept their dad's short hair on their ears too. This is really interesting ! Thanks ! 'We' were hoping for a nice mix. Dogs with long legs but a bit more bulk than purebred Groenendael, good sized ears, straight tails, nice slender muzzles but a bit less extreme as Groenendael. I think all of them turned out really nice and as we hoped! As for the colour, we expected (and hoped for!) that the dominant black mixed with agouti (aw) would give a black coat with 'grey phasing'. Making them look like black phase wild wolves in coloring. Fully solid black is unwanted in the Tamaskan. Some pups have more of this 'phasing' look than others from the litter. Sorry for the slow response, I've been so wrapped up with puppies and other priorities lately that I haven't been posted on the forum in ages. Unfortunately, the forum isn't that active these days; however, I've decided to take a step back from the gazillion+ FB groups just to focus on the forum instead, from now on (just like the good old days). Lately, I find it's getting almost impossible to follow all the groups on FB as there are just so many (some countries even have multiple groups of different factions) and many breeders have their various groups too. It's so incredibly time-consuming to keep track of everything... not to mention, pretty much impossible to try to find any old posts for reference (the FB search algorithm is a nightmare). So I'm going to "unfollow" all the FB groups and do my part to revive this forum instead, and I'm hoping you'll stick around to see it pick up again. Anyway, your English is great... much better than my French! Also, thanks so much for your kind words! The Tamaskan breed is definitely still a "work in progress" (to create a wolf-lookalike with the best possible temperament) so we're always open to potentially suitable new outcrosses. I am one of the members of the Committee of Breeders that approved the recent Groenendael in the Netherlands (Inara) as an official TDR outcross. I'm very happy with how the litter turned out and my only concerns are that, once it became public that Inara had been added as an outcross, we had a few complaints about epilepsy within the Groenendael breed (apparently it is relatively widespread, to the point that there's even an online Groenendael epilepsy database?) Also, one of the male puppies from that litter turned out to be cryptorchid. 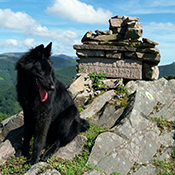 Therefore, if any other Groenendael will be added as an outcross for the breed, it would be good if it is unrelated (as much as possible) to the Groenendael that was already added (Inara) AND that it also comes from a bloodline that is clear of epilepsy and cryptorchidism (if possible). Yes, I am open to the idea and I'm sure the rest of the CoB would be interested too. We are currently in the process of updating the outcross procedure to make it more streamlined / easier for people to submit potential outcross proposals for review. What is your male's registered name? Is he in the online Groenendael database? Indeed. However, it's just worth noting that the original breed founders (in particular, the Blus) advocated for "pure black" (solid black) Tams with as little white spots as possible... I don't think they took phasing into account. For that matter, there are various different ways to achieve the "Black Grey" coloring: dominant black + agouti; agouti + black & tan or recessive black (can result in very dark agouti coloring); black & tan; recessive black (with or without grizzle/domino coat)... however, only recessive black (without grizzle/domino coat) causes solid black coloration. Sylvaen wrote: Lately, I find it's getting almost impossible to follow all the groups on FB as there are just so many (some countries even have multiple groups of different factions) and many breeders have their various groups too. It's so incredibly time-consuming to keep track of everything... not to mention, pretty much impossible to try to find any old posts for reference (the FB search algorithm is a nightmare). So I'm going to "unfollow" all the FB groups and do my part to revive this forum instead, and I'm hoping you'll stick around to see it pick up again. Sylvaen wrote: my only concerns are that, once it became public that Inara had been added as an outcross, we had a few complaints about epilepsy within the Groenendael breed (apparently it is relatively widespread, to the point that there's even an online Groenendael epilepsy database?) Also, one of the male puppies from that litter turned out to be cryptorchid. OMG !! I had NO IDEA about epilepsy on the Goenendael !!! But, I saw both Minuit parents when I took him and they both looked in good health and Minuit never showed (so far) something which could be related to epilepsy (but, as I said, it may appears later -or never- and a dog with epilepsy can look fine when he doesn't have a crisis...). He also have his two testicules well in place, as his brothers and his father. Sylvaen wrote: Therefore, if any other Groenendael will be added as an outcross for the breed, it would be good if it is unrelated (as much as possible) to the Groenendael that was already added (Inara) AND that it also comes from a bloodline that is clear of epilepsy and cryptorchidism (if possible). Minuit is not a LOF Groenendael (LOF = French stud book). So... Knowing all this now, does it still looks realistic to think about proposing Minuit as an outcross ? In which order should I work to built his application ? 2. Health tests about dysplasia, DM, eyes, does cryptorchidism can be genetically tested ? NekoCitron wrote: OMG !! I had NO IDEA about epilepsy on the Goenendael !!! I was also surprised to find out... unfortunately, it (epilepsy being a health issue in the Goenendael) hadn't been brought to our attention until after we approved the outcross but, hopefully, Inara's bloodline is clear. However, it also means that we have to be extra careful with any additional Goenendael outcrosses that are added to the breed, just to be safe. NekoCitron wrote: But, I saw both Minuit parents when I took him and they both looked in good health and Minuit never showed (so far) something which could be related to epilepsy (but, as I said, it may appears later -or never- and a dog with epilepsy can look fine when he doesn't have a crisis...). He also have his two testicules well in place, as his brothers and his father. NekoCitron wrote: Minuit is not a LOF Groenendael (LOF = French stud book). Even if Minuit is not LOF registered, it's still necessary for the TDR to have as much detailed information about the parents, grandparents, etc as possible (the more info the better!) So if you're still in contact with the farmers then definitely try to track down as much information about his background as you can (ideally with photos of his parents and grandparents, etc). It doesn't have to be an official pedigree, even an unofficial family tree is better than nothing. NekoCitron wrote: So... Knowing all this now, does it still looks realistic to think about proposing Minuit as an outcross ? In which order should I work to built his application ? First try to find out info about his bloodline from the farmers to get as much details as possible about his close relatives (their names, photos if possible, any health issues, etc). Then would be the health testing (hips/elbows and eyes) and DNA testing (DM). Cryptorchidism cannot be tested as there is not yet a DNA test for it. Either MyDogDNA or Embark is fine (neither is required but one or the other is good to have). Finally, any other health tests for issues that are prevalent in the Groenendael breed (MDR1, PRA, Thyroid, etc). Unfortunately, I can't find Inara's original outcross proposal document anywhere (the FB search feature is useless as I'm fairly certain it was posted in one of the TDR/CoB groups). Anyway, I'm sure it probably was briefly mentioned in her proposal, though epilepsy exists in almost every dog breed, but I distinctly remember we had a specific discussion during one of the CoB meetings about epilepsy being relatively prevalent in the Groenendael breed after someone in the community was making complaints and stirring up a fuss about it (you know how it goes). Ultimately, I think it's not a huge issue so long as people research the bloodlines and make careful breeding decisions about which combinations to do. Awareness and knowledge are the key to making informed decisions. It was one of our reasons to use Ravi because he has no known epilepsy risk. Inara has pretty good lines regarding the epilepsy but we knew very well that it is a problem in the breed. I wouldn't use a Groenendael from unknown lines. That's a good point. I just think it's important for people to keep in mind for the next generation(s). I am soooo happy today ! Then, with the great help of the farmers, I succeed to find the line of Minuit ! He has some Tervueren parents (but Tervueren and Groenendael are officially allowed to be breed together. Long story short : Groenendael and Tervueren are "the same" with a different color). What do you think ? Does it worth to go for the health tests ? It's great news that you were able to track his family tree. Do you know if any of his ancestors appear in the Groenendael epilepsy database? Assuming that his bloodline is clear and he is not related to Inara, I think you could probably start the health testing process. I also checked on the breeders' websites (when I could find one) an didn't find any claim about epilepsy. OK great, that's good to know. Good luck with the health testing. Good luck with the testing! I might be in Paris in June / July this year. If we meet up then I can do a temperament evaluation for your outcross proposal. I'm hoping to meet nox and lumos, as well as nox's sister Runi. My dog is uncle to those puppies. Alaska (Sylvaen Cindersoot) also lives nearby.